...my own estimates are that somewhere between 50 - 60% of all React apps use Redux , plus all of its usage with other JS frameworks Like Angular, Ember, and Vue, and that is a userbase that isn't just going to disappear overnight. Why I Wrote These Books. These books are first and foremost about me. Yes, me. My struggles with learning Redux, and seeking a better way to teach it. A few years ago, I had just learned React. I was excited about it, but again, everyone else seemed to be talking about something else called Redux. Gosh! Does the learning streak ever end? As an Engineer committed to my personal development, I wanted to be in the know. I didn’t want to be left out. So, I began to learn Redux. I checked the Redux documentation. It was pretty good, actually! For some reason, it just didn’t entirely click for me. I checked a bunch of youtube videos as well. The ones I found just seemed rushed and not detailed. Poor me. Honestly, I don’t think the video tutorials I watched were bad. There was just something missing. An easy guide that was well-thought-out and written for a sane person like me, and not for some imaginary humanoid. It appeared I wasn’t alone. A good friend of mine, someone I was mentoring at the time, had just completed a React Developer Certification course where he paid big bucks (over $300) to earn himself a certificate. The course was pretty good, but I don’t think Redux was well explained to a beginner like me. It wasn’t explained that well. You see, there are many more like my friend. I decided to find a solution. I was going to understand Redux deeply, and find a clearer way to teach it. What you are about to read took months of study, and some more time to write and build out the example projects while keeping a daily job and other serious commitments. But you know what? I’m super excited to share this with you! If you’ve searched for a Redux guide that won’t talk over your head, this is it. Don’t look further. I have taken into consideration my struggles and those of many others I know. I’ll make sure to teach you the important stuff - and do so without getting you confused. On the 20th of April, I received an email that would go on to change how I viewed things - completely! Below's the screenshot. Please read carefully. Owing to the platform I published the course, I couldn't offer him free access. So, I offered to send him money via Paypal so he could purchase the course, but he respectfully declined. "I'll save up money myself," he said. Some other developer reached out to me from Tunisia. According to him, he can't purchase anything online. Not because of funds, but because of how their banking system worked. For every book you buy, we will send a free copy to a developer in India, Nigeria, and Tunisia who can't afford the cost. Help make developer education accessible to everyone. "I don't get this Redux thing"
Yes, you've done lots of tutorials and videos online, but it just doesn't stick yet. They said it was easy. You tried. You really did. You put in time and invested some resources, but you don't seem to still get it. There's too much to take in at once! The real problem with teaching Redux isn’t the complexity of the Redux framework itself. No. I don’t think that is it. It is just a tiny 2kb library. Take a look at the Redux community as a beginner, and you’re going to lose your mind fast. There’s NOT just Redux, but a whole lot of other supposed “associated libraries” to build real world apps. If you’ve spent some time doing a bit of research, then you’ve come across them already. There’s Redux, React-Redux, Redux-thunk, Redux-saga, Redux-promise, Reselect, Recompose and many more! As if that’s not enough, there’s also some Routing, Authentication, Server side rendering, Testing, and Bundling sprinkled on it. The “Redux tutorial” isn’t so much about Redux, but all the other stuff that come with it. You're not the problem. Are you? Well, maybe Redux is so hard. You can't really understand it, eh? What if the problem isn't you. What if, all you need is a more effective mode of teaching Redux? It's worked for many, and I doubt you'll be different. In the first book, Understanding Redux - 1, I teach Redux NOT by adding complexities, but by removing as much as possible. Funny as it sounds, you don't need a ton of libraries to build a decent application. Just vanilla Redux, and your React code can do magic. The simplified Skype clone above, doens't utilize any of the tens of libraries other tutorials force on you. 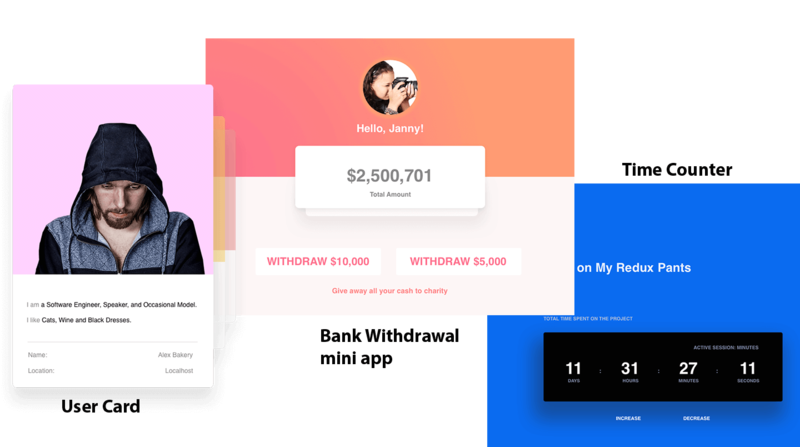 It's built with just Redux and React. Nothing else. No need for some CSS-in-JS argument, or webpack configuration. Reselect, React-Router, Ajax, Recompose, Redux-saga, Middleware....Oops, none of those! Let me hold you by the hand, Step by Step. How did you learn to walk? It's the same with learning Redux, or anything at all. The perfect way to learn any concept - at first, is by isolated practice. It isn't about taking in a ton of information without practical usage, or by learning tonnes of libraries all at once. Pros like Ussain Bolt run so fast, but they didn't stat that way. No one did. An easier way to learn. Firstly, tackle Redux by itself. No attachments. I'll break down the chunks in the most consumable bits. Only then should you move on to more advanced concepts. This is why I make no assumptions about your current skill level and explain the concepts as to a 5-year old. The books set out a tested, step-by-step roadmap for not only beginning Redux, but moving on to mastery. Be the Engineer with a solid understanding of how Redux works. The Redux Reducer, Store and Actions? They'll be your best friends pretty soon. Whatever the difficulty level, I've got you covered. I know how it feels to run into frustrations trying to learn a new concept. I suffered the same myself. You are human. I am human. No one knows it all. This is like nothing else you've seen. The explanations are crystal clear with analogies you cannot forget! The examples are well curated, and the exercises will get you flexing your Redux muscles. This is no sales gimmick. You'll be taught Redux in a way like never before. 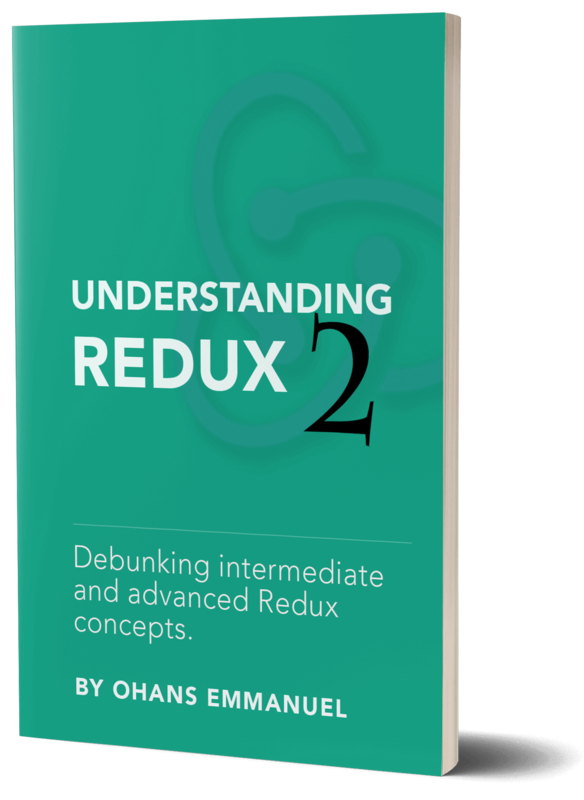 The second book, Understanding Redux - 2, builds on the foundation of the former. With a deep dive into the intermediate and advanced concepts in Redux, you'll no longer feel lost in larger codebases. You remember that scary list of libraries associated with Redux? Redux-saga, React-router, Reselect, Redux-persist, Recompose, Normalizr...Oh yeah, I'll explain how all that works! Not to mention a detailed look at Middleware, Authentication, Higher order components, and Routing. I'll explain all that! The third book, Understanding Redux - 3, takes things to new heights. We'll go beyond just advanced concepts, but will take a plunge into Real world use cases of Redux. Who else wants to learn by doing? I won't bore you without getting hands-on practice. As you progress through the series, you'll proactice by building a number of micro apps. That's how it starts. Small apps that will drive home the concepts being taught clearly! The included exercises will also force you to gets your hands busy coding. No copy and paste! You'll learn to build a mini Skype clone! Now, let me share with you what each book covers. I hope you love it! What does, Understanding Redux - 1 cover? 💥 Getting to know the Redux reducer - and why it is called a "reducer"
💥 Keeping a normalized state, and what that really means in plain, approachable language. NB: If you buy a copy of this book, we will send one free copy to a developer in India, Nigeria, and Tunisia. This book contains 3 step by step examples, and 9 exercises to reinforce your knowledge. What does, Understanding Redux - 2 cover? 🌈 Why immutability is important, and advanced ways to deal with immutability in Redux apps. 🌈 Understanding the common redux-related libraries. Think reselect, redux-thunk, redux-promise, redux-persist etc. You'll learn to build a mini Netflix clone! 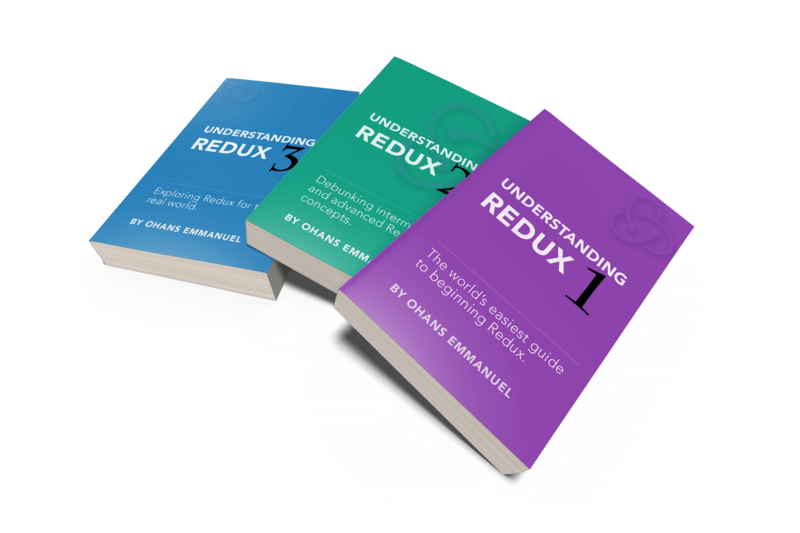 What does, Understanding Redux - 3 cover? You'll learn to build a mini Twitter clone! It could be the start of a new career position for you. You can take your skills to advanced heights, and become a more valuable Engineer. Knowing Redux really well can set you up for a promotion, or get you that dream job you've always wanted. You can finally set yourself apart as a more experienced Engineer. Whichever way you see it, this is a win-win for you, and I want to make it even better. I want you to get the most value of your purchase. If you're not happy with your purchase, just email for a full refund. Buy the entire thing. Get the three books, the entire code samples, all exercise solutions. Plus a private Slack group where you can ask me anything! If you want to work your way from beginner to badass, get the Complete Package. It is the most popular option, and it includes solutions to all Exercises, the three books, and a private Slack group where you can chat with other students and ask me anything! Set yourself up for a great career. Save up to 33% as opposed to buying each book singly! 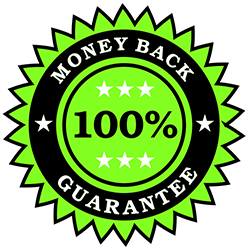 Get the complete package I have carefully created for maximum success. + a private Slack group where you chat with other students or ask me anything! NB: If you buy the complete package, we will also send the complete package for free to a developer in India, Nigeria, and Tunisia. Buy This for Your Team - 10 person license. Save over $500 as opposed to buying for each member of your team individually! Be the team manager that invests in the knowledge and productivity of their developers. Get the Complete Package for your team. + Also includes a private Slack group where any of your team members can chat with other students or ask me anything! Buy just one book, will all its code samples and exercise solutions. Plus a private slack group where you can ask me anything! If you can't afford a complete package but still want to get everything out of a single book, get this package. Start levelling up your skills without excuses. Buy a book only. No code samples, no exercise solutions. If you're on a low budget but still want to level up your skills, get this package. Pick which of the books you need now and get on with it. Help! I can't afford this. If you're from Africa, Asia, or South America, scroll to the very bottom of this page, and you'll find a special discount up to 50% off! Special preferences are given to those from India and Nigeria, with coupons up to 70% off! If you still can't afford the books despite the special coupon, please enter your details so we can send you a free copy as soon as someone purchsaes a book on this site. ONLY for developers living in India, Nigeria or Tunisia please.